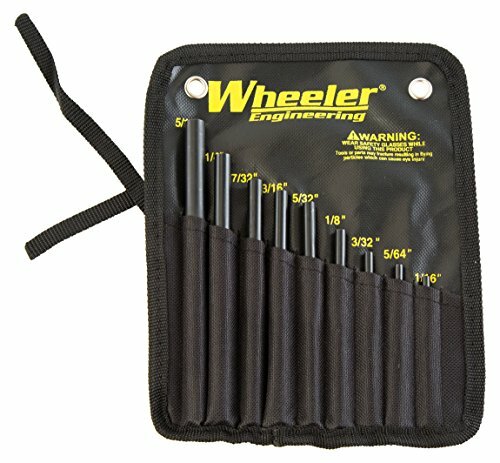 Save 1% on the Wheeler Engineering Roll Pin Starter Punch Set by Wheeler at Freedom from Government. MPN: 710910. Hurry! Limited time offer. Offer valid only while supplies last. The Wheeler engineering roll pin Starter punch set are machined from hardened steel to prevent bending or breaking while driving any size roll pin. The Wheeler engineering roll pin Starter punch set are machined from hardened steel to prevent bending or breaking while driving any size roll pin. The punches are designed with a beveled tip to provide proper alignment of the roll pin in the punch. The 9 piece set includes: 5/16", 1/4", 7/32", 3/16", 5/32", 1/8", 3/32", 5/64", 1/16" punches in a nylon pouch. 9-Piece set 1/16" through 5/16"